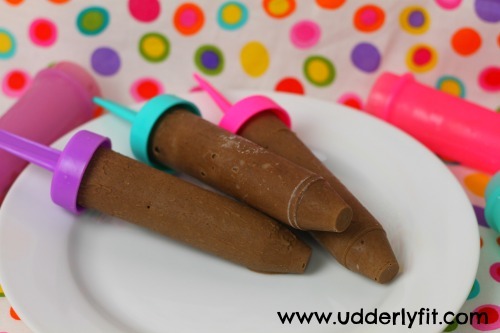 My kids love popsicles and anything to do with chocolate and the word dessert! The other day my kids were begging for ice cream, but I did not have any on hand. 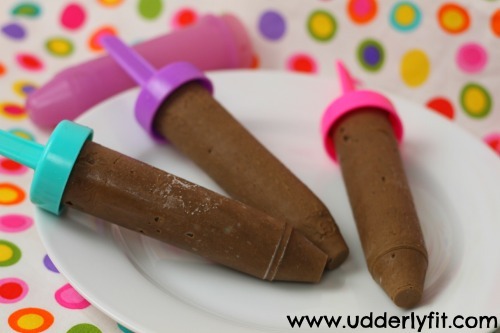 I decided to get creative and make a healthier version of some chocolate yogurt popsicles. My kids got all excited as they love to help me cook in the kitchen and often times we have found either one or all making their very own food. They helped me get a small mixing bowl, a carton of plain Greek yogurt, and a single serve packet of our favorite flavor of chocolate Shakeology. I portioned and they took turns mixing until we had a creamy chocolate almost rich mousse consistency. The yogurt and the Shakeology together were a hit with my kids and YUMMY! Take a small mixing bowl and add in the 2 cups plain yogurt. Next mix in the chocolate Shakeology and mix until it is smooth chocolate like pudding. Use a spoon and scoop the chocolate yogurt mixture into the Popsicle container then place in the freezer to harden. It should only take a few hours to be ready to eat. What is your FAVORITE Shakeology dessert recipe? 21 Day Fix Extreme – I am Excited!